Fully automatic tubeformer. This machine comes with 2 run-off tables to produce lengths up to 20 feet, 1 horizontal decoiler that handles 2 coils . This machine uses a flying saw unit for fully automatic production. 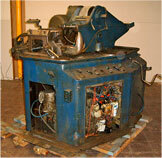 This machine is completely refurbished and comes with a 6 month waranty. automatic tubeformers produced. 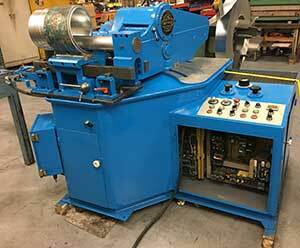 This machine comes with 2 run-off tables to produce lengths up to 20 feet, 1 horizontal decoiler that handles up to 2 coils (4000#'s). 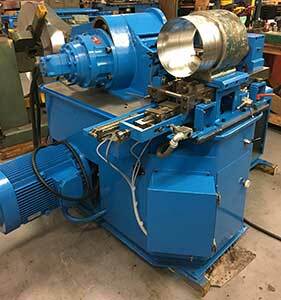 This machine has been retrofitted with a standard flying slitter which allows cutting through a 20 gauge galvanized lockseam. 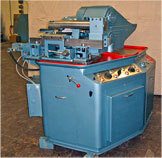 This machine is completely refurbished with a 6 month warranty.